Thanksgiving is a time to reflect and give thanks for everything (and everyone) you are grateful for. It is a time to spend with the people you love, to enjoy good food, and of course, to enjoy good beer. Did you know that pairing your Thanksgiving dishes with the perfect beer could enhance the whole dining experience for everyone (over the age of 21, of course)? Beer Pairing For Turkey: Try an Amber Ale or a Brown Ale. The browning during the brewing process is similar to the caramelizing that happens to a turkey while roasting in the oven. If you’re more of a lighter beer connoisseur, try a Lager like an Oktoberfest. Stuffing and turkey might have more of a friends with benefits relationship and sometimes things can get complicated between them. There is one thing we know for sure though, you can’t have a Thanksgiving feast without stuffing! Stuffing/Dressing and Beer Pairing: We recommend a Milk Stout or a Winter Warmer. The bread flavours in the stuffing will complement flavours in these dark beer styles. Potatoes – Mashed, roasted, scalloped, etc. Potatoes are another staple for your American Thanksgiving feast. Mashed potatoes is an obvious go-to but some States choose to roast or scallop their potatoes. Either way, you need to make sure your beer perfectly complements your Thanksgiving side dish. Potato and Beer Pairing: Since potatoes are usually light on flavour, it is great to pair them with heavier beers. This Strong Ales or Spiced Ales. Thanksgiving Veggie Dishes – Green beans, brussels sprouts, carrots, squash, etc. Beer Pairing For Vegetables: Many vegetable dishes have a lot of flavours. We suggest pairing lighter-bodied beers with veggies. Try a Light Lager or a Hefeweizen. This classic Thanksgiving dish is more popular in the United States than it is in Canada. This dish is the perfect mix between dinner and dessert. Best of both worlds! Beer with Marshmallows and Sweet Potatoes: This traditional Thanksgiving dish has very sweet flavours. Try pairing this side with a hoppy IPA! The bitterness of an India Pale Ale will enhance the sweet flavours on your palate. Every Thanksgiving feast needs to end with a great dessert. Pumpkin pie is a classic! 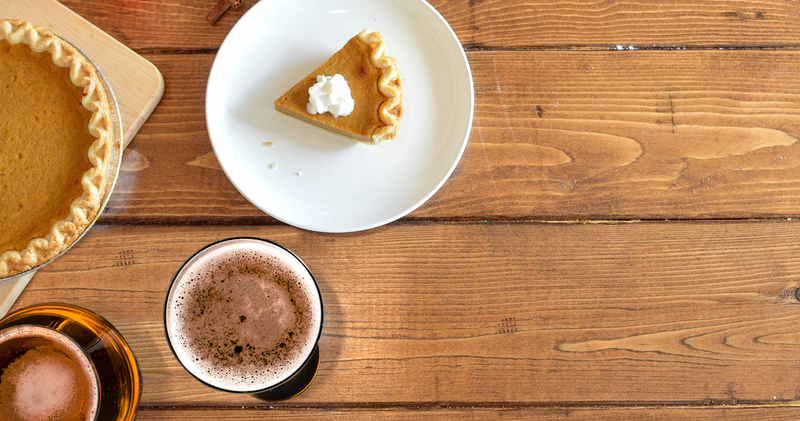 If you’re not into pumpkin pie as much as we are, Deschutes Brewery has put together this great pie and beer pairing infographic to help you out. Pie and Beer Pairings: Pumpkin pie has lots of spice flavours. Some may think that lighter beers should be paired with bold pumpkin flavours, but this would be wrong! Try a chocolate or coffee porter. These strong flavours in your beer will complement and help bring out the flavours in your pie. In 2018, American Thanksgiving will fall on Thursday, November 22. The United States Thanksgiving takes place on the fourth Thursday of November, while Canada celebrates Thanksgiving on the second Monday in October. It has been assumed that Canada copied the tradition from America, since it is the younger country but that may not actually be true. Why does the U.S. have a different Thanksgiving than Canada? Canadian Thanksgiving dates back to 1578, when explorer, Martin Frobisher, held a celebration in honour of arriving safely in Nunavut (although some people believe this story to be “mythologized”). The first official day of thanks wasn’t until April of 1872 when the nation celebrated King Edward VII‘s recovery from a serious illness. Canada didn’t actually settle on a true Thanksgiving Day until 1957, and back then it was considered a religious holiday. Americans didn’t begin their Thanksgiving tradition until 1621, when the Plymouth colonists and Wampanoag Indians came together for an autumn harvest feast. However, it wasn’t until 1863, during the Civil War, that President Abraham Lincoln proclaimed a national Thanksgiving Day to be held each November. It is not exactly known why America and Canada celebrate Thanksgiving on different days. It is commonly believed that because Canada is the more northern country that the Canadian harvest season arrives before America. It is a known fact that beer goes well with fries. Here are some great pairings as well as some ideas if you need a little twist on the classic. It’s coming up real quick that wonderful holiday full of fried, greasy goodness…Hanukah. Here’s how to cut through some of that grease…some delicious beers. BBQ should be considered a sport. It is the best way to cook meat during the hot summer heat and beer is, of course, the perfect side. Here are some great BBQ tips as well as some awesome BBQ and beer pairings.